God is, was, and will be a part of every step of creation. Given the amount of quality material out there and the fact that this is a somewhat tired and irrelevant topic for most Catholics, I’m a bit apprehensive about devoting a post to “the religion and science debate.” What more can I say that hasn’t been said better by others? On the other hand, the fact that it continues to surface unintelligently in pop culture and even in our churches tells me that it can’t hurt to try a new medium. So here we go. Science and religion. The great debate of our time. Some say that science is the only real truth, that religion is mere superstition that propagates fairy tales and manipulates people into violence. Others say that the only real truth is religion, that science is unreliable and that it denies the existence of God. Clearly, I would say, both of these opinions lack an understanding of the other and should be dismissed: even if one is the perfect option, neither lacks truth in some sense. So where does that leave us? In between the two poles you will find many saying that science confirms religion and that religion guides science. Among Christians, I would say that this opinion is the most common. What they are trying to do, it would seem, is to reconcile the differences in the two in order to create one cohesive worldview from two different disciplines. This, as nice as it may sound, is yet another misunderstanding of the nature of religion and science. The key to understanding the “debate” is that it is not a debate at all: religion and science are concerned with two completely different, mutually exclusive forms of knowledge. In the same way that art and engineering are two completely different, yet important, ways to understand a new bathroom project, science and religion have completely different goals. Science, using only empirical data (data that can be measured objectively with the senses), is concerned with the facts, that is, statements that can be proven without a doubt. Religion on the other hand, using divine revelation and human reason, is concerned with truths about our existence, that is, statements that give our life meaning. Which is better? Scientists like Richard Dawkins or Neil Degrasse Tyson want to argue that this makes science better (although I would like to note that I do like much of what Degrasse has to say.) They say, and rightly so, that the great thing about science is that if something is a fact, it is so no matter what we believe. One can not simply “believe” that gravity does not exist because one doesn’t want to. Because of this, though, they look down on religion because of its lack of proof: “How can you believe in a God that you can’t prove exists?” they ask. What they want is a scientific answer to a religious question, facts where people are searching for meaning. To me, this is like asking an artist why they paint even though it cannot provide electricity for the house. It’s ridiculous because that is not the concern of art. As far as religion is concerned, there is no proof for what we believe because proof of God would actually collapse our free will. Proof does not allow for choice; it does not allow for faith. Surely this is not what God wants. Instead, the purpose of religion is to use the evidence we have, both from revelation and reason, to find meaning in our life about God to help us assent to him. Because of this, it is a grave mistake for us as Christians to view science as anything other than an incredible resource. When we look to the world, we want to be as informed as possible as to how it works, don’t we?! It is a tragic reality that many Christians view science with skepticism, or worse yet, that they see it as a threat to their religious beliefs. Quoting Leo XIII’s encyclical Providentissimus Deus, John Paul II addressed the Pontifical Academy of Sciences with this remark in 1996: “Truth cannot contradict truth.” In other words, if something is scientifically true then it cannot be against the truth of God. Using every possible form of knowledge does not make us atheists, it makes us grateful that God gave us the ability to reason! While his theology may need a little work, I find Pierre Teilhard de Chardin, S.J. to be a fascinating example of someone able to incorporate the latest in scientific research into a Christocentric Universe. Essentially (and briefly because this post is already too long and going down a rabbit hole we might get stuck in!) Chardin took Charles Darwin’s principles of evolution that all organisms have a natural, material propensity to grow more complex and to reproduce, and added a theological element to it: all of creation has a “driving force” within it so that evolutionary steps are not random, but rather an organism’s yearning to converge on one point, Christ, the connection between the creator and created. In this way God is in not some distant creator that walked away after putting his creation into motion. He is ever creating as it continues to unfold. 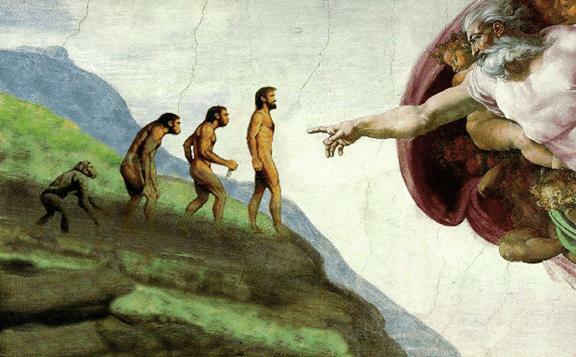 This is a really great analysis of the religion/science issue. 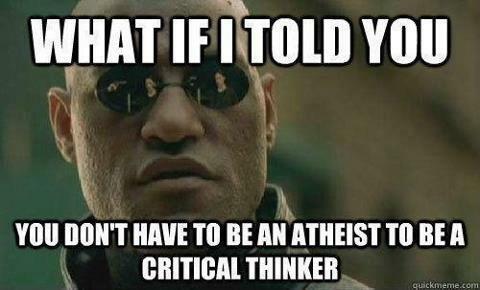 Very often I see people with whom I usually agree bashing religion as unscientific nonsense. I really think this is a great way of looking at the disciplines of religion and science, It can be hard to explain the difference between finding facts and meaning in the world to people who focus purely on empirical knowledge.